"An important story. Harrowing, and suspenseful, yes—but it's also a deep dive into a complex and egregiously misunderstood country with two very different faces. There is no better time to know more about Iran—and Jason Rezaian has seen both of those faces." While in prison, Rezaian had tireless advocates working on his behalf. 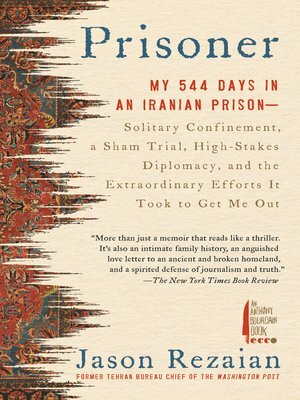 His brother lobbied political heavyweights including John Kerry and Barack Obama and started a social media campaign—#FreeJason—while Jason's wife navigated the red tape of the Iranian security apparatus, all while the courts used Rezaian as a bargaining chip in negotiations for the Iran nuclear deal.